Full service paint & wallpaper store. Our experienced staff is able to help you bring your interior design ideas from concept to completion. Stop in for tips on the latest faux-finishing techniques. Let our computerized paint color matching help you find the exact shade to match your creativity. Check out our complete line of Benjamin Moore paints. We carry a full line of professional applicators, brushes and paint sundries and serve contractors throughout Massachusetts and New Hampshire. 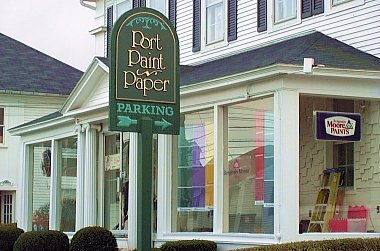 With the Newburyport area's best selection of blinds, shades and thousands of rolls of wallpaper, Port Paint n' Paper is your only stop for your interior decorating needs.